Samsung might have LucidLogix to thank for the stellar battery life of its Galaxy S5 flagship, but LG is vying for a similar glory with the just-unveiled G3 juggernaut. LG says in the unveiling event below that it is using a set of its own unique battery life optimizations, known as 3A, which has kept the endurance of the 5.5" Quad HD G3 similar to what it would be with a 1080p display, despite the significant bump in pixel density. to help keep battery life as high as possible despite the increase in resolution. The "A" in the technology stands for Adaptive, while the "3" indicates the three pillars of this system - adaptive frame rate, adaptive clocking, and adaptive timing control. Adaptive frame rate cools down the display refresh times when displaying still images, similar to what Sharp does with its IGZO display technology, for instance, thus effectively limiting the power draw on the battery unit significantly. The other two seem to be a function of the processor management - the adaptive CPU clocking and adaptive timing control limit the processor speed when running less intensive apps, and shuffles the workload around in the most efficient manner possible. Thus, one improvised test already showed six and a half hours of video playback time out of the G3, which is rather impressive given that the endurance has been tested at the screen's full brightness. So... having a "regular" 1080p screen would have given more battery which is what most people need instead of unnoticeable pixel differences... right? Not sure what your crying about. If you have a G2 then battery life is fantastic. Tell that to other manufacturers who don't optimize the phone's with these knid of technologies. 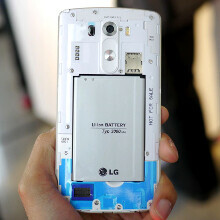 LG seems to be on a roll with all these improvements. I am not crying about anything. I am just saying that an amazing battery life would be more practical than a resolution bump. I understand that having QHD before other manufacturers gives them better marketing, but in real life people want improvement in battery life above everything else (unless is something new). Customers: We want more battery life. Manufacturers: Here, have a QHD screen. That'll impressive your friends, but make sure you have a magnifiying glass on hand. 2K screen on a 5" phone is simply stupid. A waste of processing power. Its only purpose is marketing. But oh well, it only means 1080 screens will be pushed down to mid-range phones. Screw it. I'm getting the G3 next. Most other Android flagships are considerably better than the S5 in almost every aspect, in my opinion. The G3 blows away the competition right now. "blows away" is a bit of a scratch.. Everything stil looks dead even to me.. "comparably finer" sounds more apropriate..
Smartphones are starting to flat line like computers did. Soon it will just be minor improvements every year. Its really only GPUs in computers that have been improving drastically each generation. Ok, what has improved in this G3 over the others?? I suggest wait till NOV before buying a phone. i'm going to wait for the reviews on that but my upgrade is in October so it might not be on my list even if this is true. there should be the 805 chips which in my opinion is a better combo than the 801. Lg updates track record is pretty bad in the past and now doesn't seem to change. LG's track record in the present has gotten better with updates, especially with the G2's and Flex's. Some of the carriers actually received KitKat on the G2/G Flex before the S4/Note 3. They definitely stepped up and hopefully it continues to do so. There's no end of hate on the net, someone will find something about it to hate in their eyes. No product is an island. I think that mobile industry won't go to QHD screen, because this seams to me like waste of resources that does not improve the user experience. - I hope I'm right, whole world is going in direction of raising efficiency - this is opposite way. There is no any real reason for buyers to choose QHD display on 5-6" screen. LCD's can experience burn in. The whole hype around LCD's not having burn in was created as a way for manufacturers to push out the superior/cheaper Plasma displays and charge customers 3x-4x the price for similar image quality with the flaws of LEDs like having motion blur, not as good blacks and poor uniformity. On a modern day Plasma it is near impossible the experience image burn in after the first 100 hours of use, they do suffer image retention but that fades away after ~10-15 minutes. Samsung still hasn't found a cure to burn in on AMOLED but it is very hard to permanently get it. If you want these techniques of power saving in your phone than you route it and play with your processor freq. and time to work. Unless tou don't like what your phone is doing.